OPC server allows monitoring the points of the Notifier panel from any SCADA or monitoring software with OPC client driver. The Intesis OPC – NID3K software is a standard OPC server that follows the Data Access 1.0 and 2.0 data protocol. 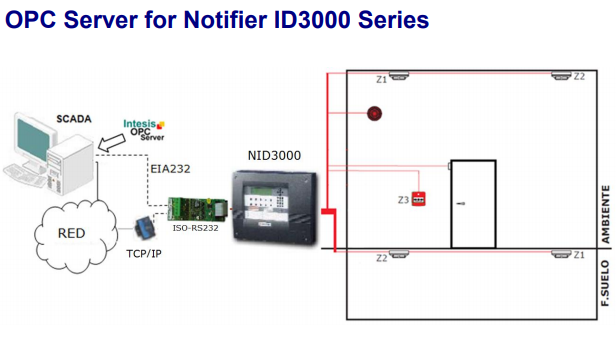 This software is intended to be used in the integration of Notifier NID3000 fire panels by any SCADA or control and monitoring system provided with an OPC client driver. Information to extract from the fire panel is indicated as OPC Items. Through the ID2NET network (using the ISO-RS232 adaptor provided by Notifier). Intesis OPC Server is a software package for WindowsTM operating systems. Control and status of the panels. Centrals: Up to 64 in each net. If the central are Standalone the OPC server can only integrate 16 of them. 1 to 8 loops (depends on the panel). Detectors: 1 to 99 per loop (depends on the panel). Modules: 1 to 99 per loop (depends on the panel). 1 to 255 zones (depends on the panel). An indication of a communication error with the panel. Half/duplex (opto-isolated ISO RS232 board, recommended). Simple configuration: COM, baud rate, etc. A free RS232 port in the PC is needed to connect to the panel.